As you may know, my children started school last week. On very the first day, as we got ready to head out the door... my daughter decided that it was CRITICAL to have a reminder of home. Believe me, we had talked about what she might need for weeks leading up to this moment. Do you remember last year's lavender heart sewn for her very first day of school? It had already been declared too young for this big 5 1/2 year old. Without wasting a moment (thank goodness! ), she chose a special pink stone, but had no place to put it. Not a pocket in sight. "Can't you make something, Mama?" My girl is used to the answer being "yes", and obviously wasn't grasping the ticking of the clock, or the fact that I was still in my pajamas! What would you have done? With an idea of what was needed: an amulet or small pouch to wear around her neck, we raced off to look for materials. Spying some rainbow grosgrain ribbon, I knew we could whip something up in minutes, and the day would be saved. If you know someone who likes to keep treasures tucked close by, or needs to carry a little love around their neck... this might be something to try. I have a sneaking suspicion that they will end up as favors for our next birthday party. I know you'll overlook my messy quick stitches... that clock was a tickin'! Roll and tuck under each short end. Sew down to minimize fraying. Fold up one side to create a 1 3/4 inch pouch. Sew it up with a quick top stitch on both sides. 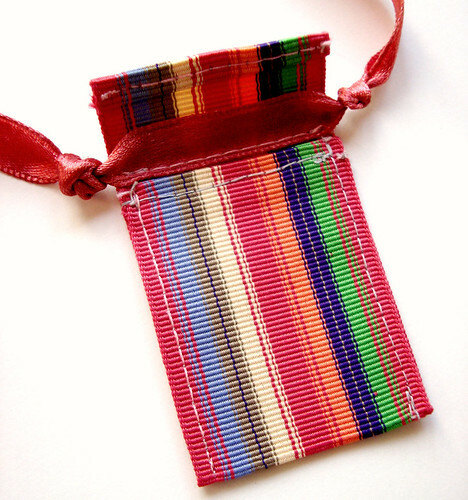 Place the center of a length of satin ribbon directly above the opening of the pouch on the inside. Sew in place. Knot the satin ribbon on each side of the pouch. 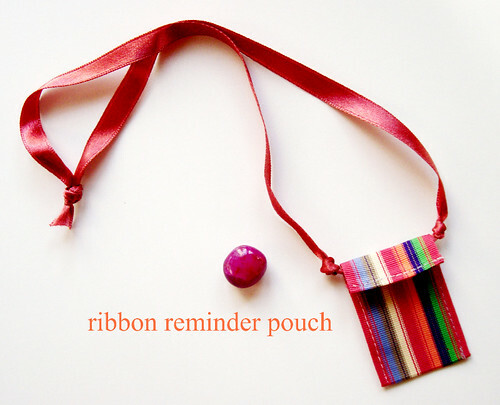 Knot the satin ribbon around the wearers neck with enough room for the pouch to slip on and off easily. If you have time, iron the pouch flap down. Note: My wearer likes to tuck the flap inside to keep her treasures extra secure. A snap would work well, too. this is very sweet. 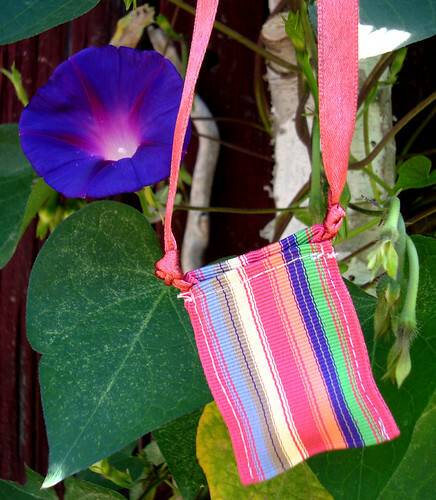 we recently made similar little pouches, it's a great projects for little hands. your question reminds me of the children's book "the kissing hand" ..have you heard of it? a little kiss in the palm of the hand that's carried with you as you go new places and experience new things. ana- we love "The Kissing Hand"! I bet there are many kids with hands full o' kisses out there this week! such a quick and cute idea - i wonder if i can adapt it to make a more boy friendly version, my 5 year old ALWAYS has a stone or treasure he needs to carry around! How about a plain colored ribbon and some cotton string vs. pink satin and rainbows;) I'd love to hear what you come up with! what a grand idea! my oldest son also liked to carry a rock with him to school when he was little... i always told him whenever he looked at the rock, he would know i was thinking of him....luckily he had jeans pockets...believe it or not, he still has his rock! i love this idea and you were so clever to come up with it on a moments notice! I cut a little heart out of felt and embroidered T + M + D on it. Mom and dad hug it and kiss it, then the little one shoves it in her pocket or backpack just in case she needs some hugs and kisses while she's away from us. I like the fact that your little one knew that her mom could fashion just the right thing for her in a pinch. And she was right. Sweet. I am loving looking through the books you love!!! Fabulous collection!!! That is so lovely. For some reason it reminded me how us Catholics used to wear scapulars around our necks. You are a lovely mother. Hi Maya, love your blog. My youngest daughter started University this past weekend and is 2 hours away. I gave her a beautiful silver necklace with 2 entwined circles with the engraving: Mother, Daughter, Forever Friends. the necklace can be worn with the engraving turned around. Saw her 3 days later and she was wearing it! Children need reminders of our love even when they are older! What a sweet project, Maya! Some of the best projects are made when we are under the gun. This is adorable. I want to make one just to wear as daily jewelry and keep a couple of little treasure in it to play with when I'm bored. way to save the day mom, big star for you!!! That is such a lovely sentiment Maya! I'm totally smitten with this idea. Thanks so much for the how-to, I'll be linking.